Alternative to Expensive Stainless Steel Tanks | Buchholz-Smith, Inc.
For decades, stainless steel tanks have been the most common choice for industries where high purity, sterility, and "cleanability" are of paramount importance. There is no question that the shiny appearance of stainless steel and its proven performance make it an easy material choice for all kinds of process tanks used in food processing, high-purity water, chemical and laboratory applications. 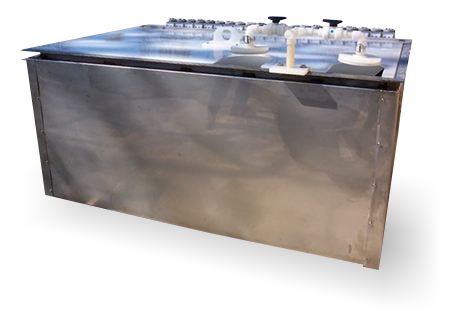 While we specialize in polypropylene tanks at BSI, our experience in fabricating tanks and our extensive knowledge of the plating industry has made us the ideal source for all types of stainless steel tanks as well. We know that many processes require stainless steel tanks so we fabricate custom stainless steel tanks in a wide variety of sizes for a number or processes. For some applications that have traditionally required stainless steel, today’s plastic tanks can often perform equally or better at a fraction of the cost. In addition, plastic tanks often require shorted lead-times and can be fabricated in translucent materials so fluid levels can be easily monitored. Comparatively, stainless tanks often require gauges, viewing ports, sensors or other devices to monitor changes in fluid volume. BSI's capability in designing tanks with reinforced side walls and heavy duty welds in a variety of plastics provides you with an alternative to stainless steel tanks.